The Molecular Devices SpectraMax 190 Absorbance Microplate Reader mimics a dual beam spectrophotometer, and measures each sample in the plate directly. This eliminates measurement error due to variations in light output between optical fibers on other instruments for more reliable data reporting. The eight-channel system of this plate reader delivers both high precision and speed when reading 96-well microplates for endpoint measurements, kinetic assays, and spectral scans. The optical system of the Molecular Devices SpectraMax 190 Microplate Reader is built around a monochromator, which allows for selection of up to six wavelengths at a time for absorbance detection in the UV-visible wavelength range (190 nm - 850 nm). The Narrow bandwidths of the spectramx 190 delivers increased measurement accuracy and linearity over the widest range of assays, including DNA quantitation in the UV range. Using the patented PathCheck Path length Measurement Technology, the SpectraMax 190 Microplate Reader transforms each well in a microplate to a fixed optical path length cuvette. This temperature-independent normalization corrects for varying well volumes and can eliminate standard curves by allowing the calculation of concentrations directly from the absorbance with a known extinction coefficient, as exemplified with nucleic acid and protein quantitation. The SpectraMax 190 Microplate Reader is supplied with SoftMax Pro Data Acquisition & Analysis Software, Molecular Devices' industry leading all-in-one data acquisition and analysis software. Additionally, the SpectraMax 190 Microplate Reader can be seamlessly integrated with the StakMax Microplate Handling System through the SoftMax Pro Software. 23 x 16 x 9"
This Molecular Devices SpectraMax 190 Microplate Reader has already been tested and calibrated to manufacturer's specification. This reliable UV/Vis Microplate reader is in excellent condition, backed with our standard warranty and ready to ship. 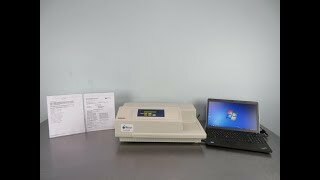 Please contact the LabWorldGroup today with questions about this reliable used microplate reader.